There are many different types of skin conditions that can cause a rash on your dog. Most dogs lead a fairly active life and can get into things that will irritate their skin. The problem is, our dogs can’t tell us that they’re uncomfortable! We’re often left to interpret their feelings and discover a dog rash on our own. If you have a pet that particularly enjoys playing in nature, to prevent skin irritation, you should make sure to bathe your dog regularly. Dust and dirt can work their way through your dog’s coat and irritate their skin if it becomes trapped under their fur. Also take into consideration poisonous plants that can cause an allergic reaction or a dog rash. If you have a dog that prefers the comfort of the “great indoors,” you must also watch for skin irritation. Many times, home environmental systems will dry the air that is pumped around your home. Just as it can affect people and require treatment for dry skin, it can do the same to your pet. While irritated skin or a rash is uncomfortable for your dog, it could only be the start of a more worrisome skin problem. Dogs don’t understand chronic itching and will simply try to scratch and bite until the discomfort goes away. The problem is, this can further irritate your pet’s skin. Eventually, if left unchecked, this can lead to a dangerous infection. By far the best way to keep any dog rash or skin irritation in check is to keep your animal clean. Our special Skin-eze Shampoo will help you keep your dog clean and comfortable and help to soothe any patches of dry or irritated skin. If your dog spends most of their time indoors, they will only need to be bathed about once a week. Animals that spend a lot of their time outside, on the other hand, may need bathing more often. During the winter, your dog should also have their paws cleaned. Their paws may pick up road salt, which is particularly harmful. We also offer a larger variety of treatments for dog skin problems. If you believe skin allergies to be the cause, consider a safe, all-natural treatment such as our Skin-eze Herbal Capsules and Tablets. Or look at one of the Full Treatment Packs if you pet has a more severe skin condition. Give your dog the relief they need from an uncomfortable dog rash or irritated skin. It’ll mean a happier pup and a happier you! If your dog has a rash or other skin condition, consider one of the all-natural remedies from Allergic Pet today! When your dog is having a seizure, it’s a scary experience. All of a sudden, man’s best friend is lying on the ground and you don’t know how to cope. The worst part is that while it’s scary for you, you know it’s even worse for your dog. Well, here’s a brief overview of what epilepsy in dogs looks like and how to treat it. Epilepsy is a condition that causes a dog to have an attack of the nervous system. An epileptic attack can leave a dog unconscious, dazed, or twitching. Causes of epilepsy include brain lesions and genetics. However, all seizures look different for every dog. Epilepsy in dogs can leave the animal stiff, urinating, defecating, or with a variety of other symptoms. Each individual animal has a unique reaction. When dogs are younger, epilepsy can be more severe, but the good news is that they will also respond to treatment better than older dogs. When you begin noticing your dog’s epilepsy, it’s important that you keep track of your dog’s seizures and tell your vet about the frequency and intensity of each one. Your vet can diagnose epilepsy in dogs better with more information, and in the end, your dog will receive better treatment. Once you’ve visited your vet, you can also treat your pet with an all-natural remedy through Allergic Pet. Nuroplex consists of herbs and has no side effects. You can also use it in conjunction with your dog’s prescription medication, which will help your dog remain seizure free longer. You will love that it has no side effects and that your pup won’t even notice taking it. Try out Nuroplex to relieve the epilepsy in dogs that you find so frightening. We know you’ll love the results. Has your cat been acting a little abnormal lately? Maybe they’re scratching a little too much, losing their hair, or sneezing all over. Well, if this happens persistently, there is a good chance that your cat has some cat allergies. Cats can have allergic reactions to some of the same things as humans, like smoke, grass, food, fabrics, and cleaning products. So, with all the different products you use around your home, it’s not irrational to think your cat may be allergic to something in your home. First, think about any recent changes that may have happened in your home. Did you just try out a new cleaner? Did you let your cat out into the backyard for the first time in a few years? Even something as simple as adding new throw pillows could be irritating your cat if they are allergic to the fabric. Isolating these incidents and removing the possible triggers one at a time is the best way to find the source of the cat allergies. If you can’t identify the variable that is making your feline frantic, then you should visit your veterinarian. There, they will be able to run a series of tests to determine what is ailing your furry friend. Once you’ve got a diagnosis, you may want to hop onto AllergicPet.com to find a product that is perfect for your cat. For instance, if your cat allergies affect your pet’s skin, our product Skin-Eze is perfect. Our herbal remedies take a holistic approach to the problems that are bothering your pets the most. You can use them in accompaniment to your vet’s medications or on their own—they work great either way! 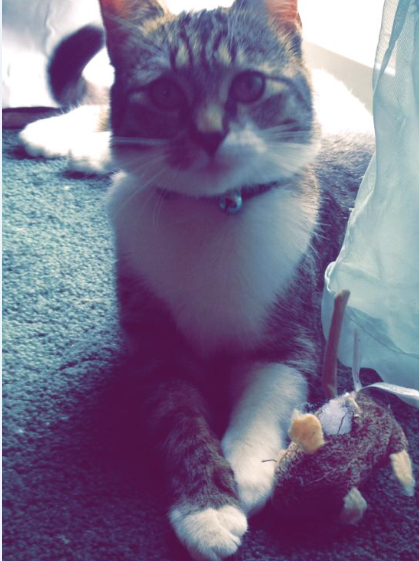 Get started healing you’re the cat allergies that have been driving your pet crazy today! Did your pup have a meal and something bad brewed in its stomach? Or maybe he just thinks that twigs and grass are good substitutes for puppy food. Whether or not this is the reason your little guy has puppy diarrhea, one of your top priorities should be taking him to the vet. While you may be sure that the reason your puppy is having problems is his diet or stress, there could be a whole mess of problems with your puppy internally that you aren’t able to see. If your puppy is actually ill, it’s better to check and make sure that they are good and well than to let it go and have your puppy be actually sick. After taking your pet to the vet for their puppy diarrhea, you will probably get a prescription remedy for your dog. If you don’t, your vet is probably confident that the diarrhea will wear off quickly and was stress-related. However, in an animal as small as a young puppy, you want to ensure their internal health. That’s why it is important for you to invest in a holistic product for your animal as a supplement to veterinarian care. Allergic Pet’s Diar-Eze is the best way for you to alleviate puppy diarrhea and the suffering of your pet without needing a prescription. 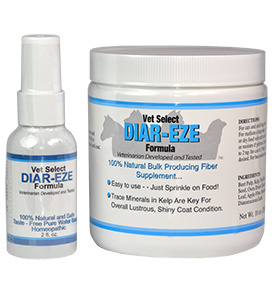 The herbal formula in Diar-Eze makes it an all-natural remedy for all puppy diarrhea. The good thing is that you can also use this with your prescription from the doctor. That’s great, because you don’t have to stop one treatment to begin another. Don’t let your pet continue suffering, and don’t pump them full of chemicals and drugs to fix their diarrhea. Instead, give them the all-natural remedy: Diar-Eze. Your puppy will thank you in the end.